MITZPE RAMON, ISRAEL — Could the contrast be any more dramatic than when comparing the Wooster Alaska expedition images on this blog to those here from the Wooster Israel team? Alaska looks so very green, cold and wet from here! Two Wooster geology seniors in very different places this week. Andrew Retzler (left) is enjoying some respite from the blazing sun in southern Israel; Stephanie Jarvis (right) is cooking soup on the ice in Alaska. These two students have known each other well since they were both in Hayden Schilling's First Year Seminar course three years ago. Today we explored what we call the “Southern Section” of the Menuha Formation (Late Cretaceous) south of Makhtesh Ramon. The structure here is as complex as I’ve ever worked with, from overturned beds to limestone dikes. (Yes, petrologists — limestone dikes.) We found plenty of shark teeth for Andrew and Stuart’s projects, and through our friend Yoav Avni had an excellent introduction to the complex stratigraphy. Way complex stratigraphy. 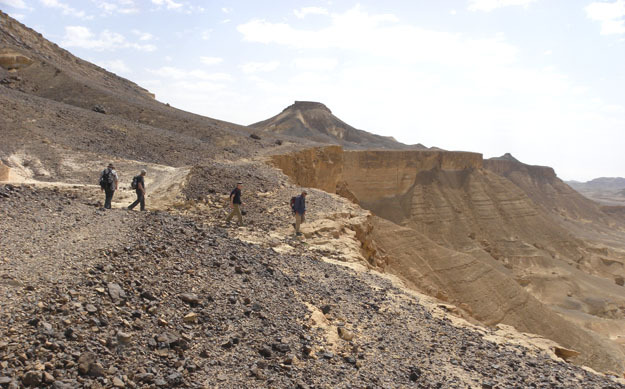 Walking along the base of the Menuha Formation south of Makhtesh Ramon. 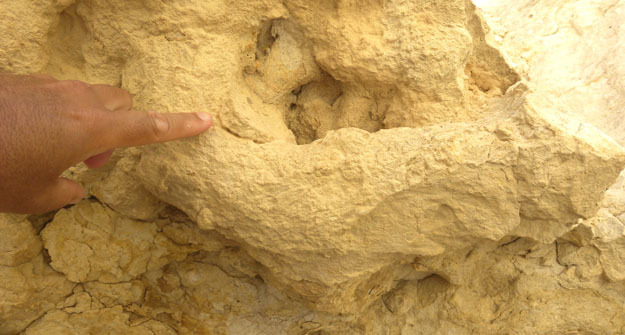 The trace fossil Thalassinoides near the middle of the Menuha Formation. This structure may prove important for sorting out the depositional environment of these beds. Shark teeth recently found by Andrew in the Menuha Formation. The one on the left was from today's work; the one on the right from yesterday.